It turns out this geometric shape has been given a cute name: squircles (Who said geometry has to be dull?) The entire family is known as supercircles. And of course, there is a analogous generalization for ellipses known as superellipses. (I don't think there's a "sqellipse", however - and maybe that's just as well). 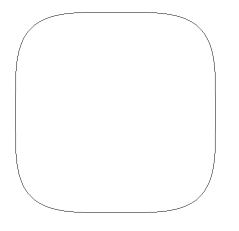 This page allows you to generate supercircles for different values of n. (Incidentally it uses Walter Zorn's very slick jsGraphics library for generating pixel & vector graphics on web pages). Useful? Sort of - Wikipedia has a few examples, mostly in the decorative arts. And I'm betting that a concept this elegant is bound to turn up in lots more places. So maybe I should add this to JTS, just to - ahem - get ahead of the curve. 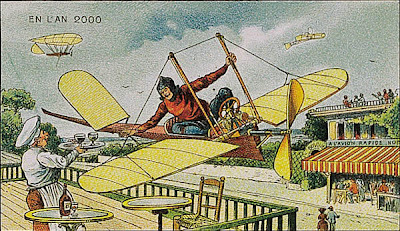 The Bibliotheque Nationale de France has an online exhibition of a vision of the world in the year 2000 - published in the year 1910. It's interesting to see what the artist got right, and what he got wrong. Air-Sea Rescue - but also radium fireplaces. He correctly predicted that electric power would replace human labour - but he didn't foresee that the biggest impact would be from automating thought rather than muscle. He also didn't see that the fashions of 1910 would not be a la mode in 2000. But it's an appealing vision... I'm still hoping for my personal monoplane to get me to work. > > just one question .. what is this bursa wolf parameter option? > My impression is that this is scary math I never quite understood. taxes so no one cares too much. all those "one true" ellipsoids. really are and how they line up on the estimated ellipsoid being used. parameters to move between them. Office 2.0 is an index of Web-hosted applications. The entire list is pretty overwhelming, but more immediately interesting is the list of Web apps that the site's creator uses as his "everyday applications"
Here's an important conference which unfortunately I missed last year. But no matter - the content is timeless, so no doubt it will be held over and over again with exactly the same presentations. Here at Refractions we're starting to think about how we can provide better support in PostGIS for geodetic data. Geodetic data is data which is defined in a true spherical coordinate system (in particular, of course, the surface of the Earth). Currently PostGIS provides some geodetic-aware functions (such as distance between two geodetic points). But it's current spatial data model is fundamentally planar, so there are definite limitations to modelling geodetic data (e.g. such as the notorious "line crossing the Date Line" problem). As PostGIS gets used for larger datasets and more ambitious projects, the utility of having a full-function geodetic data model is becoming increasingly obvious. Handling geodetic data in a correct and efficient way presents quite a few challenges. A major one is: how can geodetic geometry be spatially indexed? Conventional spatial indexes (such as 2D R-trees) all rely on geometry being embedded in a planar space. They don't handle data which can "wrap around", as can occur in a spherical space. Hipparchus Voronoi-based index. This index can be thought of as a fixed-grid index using a custom Voronoi cell coverage for the globe. IBM's DB/2 Geodetic extension uses this scheme. I must say that this concept, while ingenious, seems a bit baroque to me. This index has the usual disadvantage of fixed-grid indexes of not handling widely-varying data sizes well. And it also requires extremely complex cell coverage structures, which have to be selected specifically for the expected data composition. DB/2 supplies 13 different ones based on various data densities (G7 industrial output, anyone?). I'm not sure what you are supposed to do if your data has some other density distribution - it doesn't seem very feasible to make your own Voronoi grid. And what if you don't know your data distribution, or it changes over time? 3D Bounding Box - this is the approach used by the pgSphere project. It's pretty straightforward. The key concept is to embed the sphere in 3-space, so that it is possible to compute 3D bounding boxes for geometries on the embedded sphere. The bounding boxes can then be indexed using a 3D R-tree (exactly analogous to a 2D R-tree spatial index). The GIST index supplied with PostgreSQL can be customized to provide the required 3D R-tree. One possible issue is that apparently R-trees become "less effective" in higher-dimensional spaces. It remains to be seen whether this is truly a serious problem. Out of these options, it seems like the 3D Bounding Box approach is the most straightforward scheme. There's some challenges in developing the mathematics required (at least, for a planar/linear guy like me), but I'm hopeful that we can deal with these issues and arrive at a efficient, maintainable solution. If REST and WS-* are at war, which one are they fighting? Ted Nedward has another great post providing lessons about technical, political and historical issues all at the same time. Oracle provides a very powerful SQL extension to evaluate hierarchical queries (transitive closures) on tables. This recently saved my bacon in a system which processed a table modelling a tree containing several hundred thousand rows. The alternative would have been to do some very ugly and inefficient iterative querying. For modelling tree-structured data, the usual pattern is to have a table with id and parent_id columns. In a hierarchical query you may wish to traverse the tree either upwards (towards the root(s)) or downwards (towards the leaves). But what query syntax should be used to produce the desire direction? 2. All rows for which the CONNECT_BY condition is true are added to the result rowset. The PRIOR keyword determines which one of the condition expressions is evaluated in the context of the result rowset rows. 3. Step 2 is repeated until no further rows match. Formally, this procedure computes the transitive closure of the relation defined by the initial START WITH set and the CONNECT BY condition. There's several other useful parameters for defining hierarchical queries in Oracle, such as NOCYCLE, LEVEL, CONNECT_BY_ROOT, CONNECT_BY_ISLEAF, etc. It's well worth studying how to use these to improve query power and performance. Natural Docs looks like a nice generator for code documentation. It's multi-language, with a more natural commenting style than Javadoc. It seems to be in fairly steady development, and has a slick homepage. A quick browse of Wikepedia reveals a zillion documentation generators. This isn't really a surprise - once again the OSS ecosystem thoroughly fills a technological niche! Robodoc and Doxygen are other leading players. Wikipedia is (rightly) very neutral in its comparison. I'd be interested to learn if there is a reason to prefer one more than the others (say, from the point of view of wanting to support a new language).